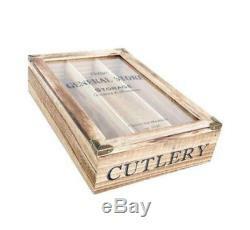 Vintage Style Wooden Cutlery Tray With Glass Top. A lovely Vintage Farmers Market Cutlery storage box. The brown wooden finish features a distressed rustic appearance. The three internal storage compartments are ideal for segregating all your cutlery neatly. Hinged glass lid (opens to 180 degrees). Size: L-28cm x W-19cm x H-7cm. Material breakdown - 60% paulownia wood, 20% Plywood, 10% glass, 10% iron. The item "Vintage Wooden Cutlery Holder Tray Organiser Box With Glass Top Shabby Chic" is in sale since Wednesday, July 5, 2017. This item is in the category "Home, Furniture & DIY\Cookware, Dining & Bar\Food & Kitchen Storage\Racks & Holders". The seller is "bestvaluedirect-co-uk" and is located in Derby. This item can be shipped to United Kingdom.